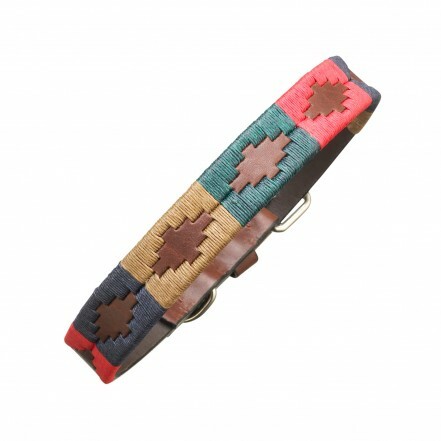 This Navidad leather pampeano dog collar is a favourite in our luxurious leather dog collar collection and has been hand-stitched with vibrantly coloured saddlery threads in gold, navy, red and racing green. Please note that these lengths are taken from just the length of the leather on the dog collar, not including the buckle. The leather that has been used on all of our dog collars is exactly the same as that used on our stunning popular Argentinian pampeano polo belts. It has been hand selected by us in Argentina and expertly vegetable-tanned to create a finished product that is rich and supple yet tough. The quality is unquestionable and consistent throughout all of pampeano&apos;s leather products. The Aztec pampa patterns and diamonds are inspired by Argentina, its stories, history, traditions and landscapes. They are all hand-stitched by our own skilled crafts people who have perfected the technique throughout the generations as it is passed down within their families. With all of our hand-made products, you are getting a true piece of Argentina that is original and unique, making it that extra bit special with no two ever being quite the same. An Argentinian leather dog lead is also available to match this eye-catching polo dog collar, again made from the same luxurious leather and designed with the same bold Navidad stitching. The dog lead is available in one standard length and two widths skinny and standard to suit the size of you chosen collar. Due to popular demand, a matching Navidad polo belt has also been added to our colourful collection so now you and your furry friend can be perfectly coordinated when out on your dog walks. Perfectly teamed with a pair of denim jeans, brown riding boots or green wellingtons and a padded gilet, a country walk has never looked so chic.